Local expert A.J. 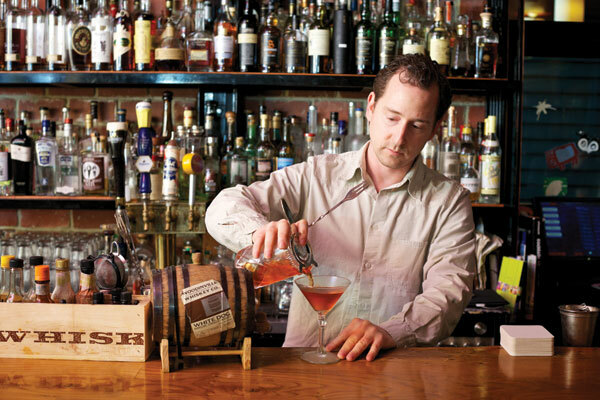 Rathbun finds the best barrel-aged cocktails at local bars. When writing about aged cocktails, I feel I should start with, “It all starts a long time ago, in a faraway place,” as if my grandfather were telling me a story. In the case of the aged cocktail trend, that long time ago was the fall of 2009 (which is about a hundred years ago in today’s nano-fast cocktail culture), and the faraway place was a bar with no name at 69 Colebrooke Row in London. A renowned bartender there, Tony Conigliaro, was visited by a renowned Northwest bartender, Jeffrey Morgenthaler of Portland’s acclaimed Clyde Common. Conigliaro had taken to aging Manhattans in glass containers, and Morgenthaler was appreciative of the end results, so much so that he started his own experimenting—but in oak barrels. He wrote about it on his blog, JeffreyMorgenthaler.com, a popular bartender read, and before long, bartenders everywhere were premixing cocktails and aging them in barrels. To pique customer interest, he started a “Barrel-aged Cocktails for the Masses” program, in which he takes suggestions from customers on which cocktails to mix and put up in 5-liter barrels, where they’ll age for six to eight weeks. He currently has about 15 in a rack above the bar’s front door; when they’re ready to drink, they’ll go on sale to the public. Liberty and other bars, such as Tavern Law on Capitol Hill, are similarly experimenting with aging individual spirits, such as gin, in barrels. After aging the spirits, they’ll mix them into cocktails. Tavern Law bartender Michael Fawthrop calls the outcome “aged happiness,” both for bartenders and adventuresome drinkers. Another force that kick-started barrel-aging in Seattle was the Woodinville Whiskey Company with its opening in 2010. The company uses charred oak barrels to age its whiskey, but it also helps bars and restaurants find pre-charred barrels—ranging from half-gallon to 5-gallon size—for aging cocktails. Do-it-yourselfers can take up cocktail aging at home with Woodinville Whiskey’s take-home aging kit ($149.99); Liberty’s Andrew Friedman offers his wisdom on what to avoid: low-alcohol combinations or drinks with fresh citrus (the former don’t age well and the latter go bad). There is one very difficult aspect to preparing your own barrel-aged potable, however: the one and a half to three months of waiting to have that first sip. In my view, there can be a downside to cocktail aging. In some situations, aging a classic cocktail devalues a flavor profile that’s stood the test of time. The classics are on the all-star cocktail menu for a reason, after all. Not every mix is going to age well—barrel-aged Negronis abound, and I haven’t had one yet that holds a cocktail glass to the original. But if the trend means bartenders are continually looking to add to their spirited arsenal of ingredients with the tasty idea of serving more delicious drinks? That’s never a bad oaken road to take. These cocktails are made in small batches, so they might not be on a current menu. Most barrel-aging takes one and a half to three months, depending on taste and bartender preference. However, there may be a fresher barrel-aged drink available, so always ask. This combines Woodinville Whiskey Company’s Headlong White Dog unaged whiskey with chamomile-infused grappa liqueur and lemon bitters before going into the cask. Once out, it’s mixed with lemon juice, and has floral and citrus notes underlined by oak and White Dog’s sizzle. Bringing together Sauza Blue blanco tequila, Dolin dry and rosso vermouths, Campari and angostura bitters in the barrel, this early-evening sipper has suggestions of spices, smoke, herbs and an international presence. Head Strong in name but not personality, this slightly sweet number balances Woodinville Whiskey Company’s Headlong White Dog whiskey with Italian liqueur Aperol, Italian vermouth Carpano Antica and a garnish of house-brandied cherries. Adding a Caribbean insinuation to the barrel, this drink combines Venezuelan Pampero Aniversario dark rum, herbal darling Carpano Antica, angostura bitters’ jumping accents and rich pomegranate molasses. Smoky mescal is transformed by spending four months in a barrel first seasoned by having Italian liqueur Campari spend five months in it. The barest hints of bracing Campari mingle with the singular mescal, and the cask charms the angles off.